Temperature regulation is omnipresent in the world we live, for example, every living creature has autonomous bodily functions to regulate temperature. Artificially, central heating systems work in the same way, the user sets the desired temperature and the system detects the current state and makes adjustments to the temperature. A resistance temperature detector (hereby referred to as an RTD) is a temperature sensor which exploits the basic principles of science to play a key role in process control. Within a basic RTD the change in resistance of the element is small in comparison to the change in temperature. 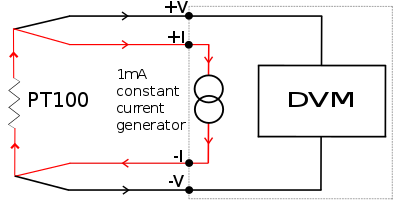 Therefore a bridge circuit is used to allow the measuring of the voltage drop across the resistor when applying a small constant current. Once the sensing element (see figure 1, below) has been placed where the temperature needs to be monitored or controlled, it will reach thermal equilibrium with its environment. At that temperature, the element will exhibit a certain value of resistance, this resistance is calculated and converted into a temperature which is fed back to the end user. Any change to the temperature of the environment will be represented by the change in electrical resistance of the RTD. Carbon resistor elements- these elements are cheap and popular. At low temperatures these elements are at their most reliable and are highly reproducible. 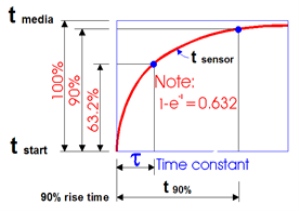 Another advantage is that carbon resistor elements often don’t suffer from hysteresis. Strain free elements- used in SPRTs (the highest accuracy of all RTDs) and can work up to 961.78Â°C. These elements consist of a wire coil surrounded by inert gas. Thin film elements- a very thin layer of resistive material is deposited onto a ceramic substratum and coated in epoxy. These elements are not as stable as wire-wound or coiled elements, and they are only effective over a small temperature range. However they are smaller and cheaper than the standard wire-wound elements. Wire-wound elements- have a greater accuracy over wider temperature ranges. They consist of a length of pure metal in the form of a wire, usually wrapped around a glass or ceramic core. The elements are usually very fragile, and therefore, need protecting with a sheath. The diameter of the coil minimises the strain on the element by compromising between mechanical stability and expansion of the material. Coiled elements- currently the technology of choice, replacing wire-wound elements. They consist of a stress free design which lets the coil expand and contract freely as the temperature changes. The housing is made from ceramic oxide and the coils are threaded through bores, which are packed with fine ceramic powder. These elements are effective up to 850Â°C. The most common materials used as RTD elements are platinum, nickel, copper, balco and tungsten. Platinum is the most popular due to it being very repeatable and quite sensitive, balco and tungsten are very rarely used. 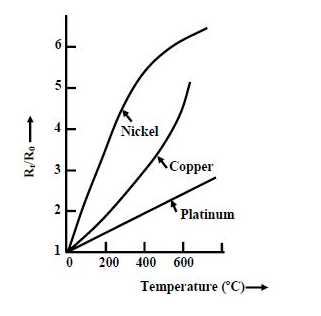 Platinum, copper and nickel have temperature ranges of 650Â°C, 300Â°C and 120Â°C respectively and exhibit strong linear properties over a wide range of temperature. (see figure 2, below). The most common type of RTD used within industry is the PT100. This RTD has an element of pure platinum and has an electrical resistance of 100â„¦ at 0Â°C, hence the name PT100. The resistance of a typical PT100 RTD changes at 0.39â„¦ per 1Â°C. As the name suggests, this PT100 RTD uses two wires. However this configuration does include a possible source of error where the resistance of the connecting wires is added to the resistance of the sensor. 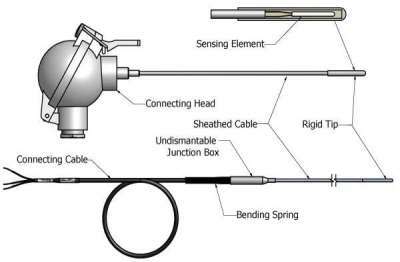 Should a company or individual choose this configuration they can combat this source of error by mounting a temperature transmitter close to the element. This configuration is best used when high accuracy is not required. The three wire configuration is the most widely used minimises the effects of the lead resistances. The two leads to the sensor are on adjoining arms, in each arm there is a lead resistance which is cancelled out if the two lead resistances are accurately the same. The accuracy of the measurement of resistance is increased by using the four-wire configuration. Voltage drop in the measuring leads is eliminated using four-terminal sensing. 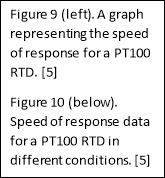 PT100 RTDs are extremely precise. A tolerance of Â±0.75Â°C is applied up to 300Â°C, for temperatures between 700Â°C and 800Â°C a tolerance of 1% is applied. A PT100 RTD has a long term stability of around Â±0.2% of the 0% value over a 1000 hour (one year span). This test was conducted in special ovens with air heated to 800Â°C. This property is arguably the greatest property of an RTD. B.R. Mehta, Y. Jaganmohan Reddy. (2014). Batch Automation Systems. In: B.R. Mehta, Y. Jaganmohan Reddy Industrial Process Automation Systems: Design and Implementation. -: Butterworth-Heinemann. 135. Correge. (). Head- or cable type mineral insulated probes. Available: http://www.correge.fr/rtd-sensor-mineral-insulated.html. Last accessed 11th Dec 2016. Various. (2016). Resistance Thermometer. Available: https://en.wikipedia.org/wiki/Resistance_thermometer. Last accessed 21/12/2016. Acromag. (2011). CRITERIA FOR TEMPERATURE SENSOR SELECTION OF T/C AND RTD SENSOR TYPES . Available: https://www.acromag.com/sites/default/files/RTD_Temperature_Measurement_917A.pdf. Last accessed 21/12/2016. Thermo-electra. (-). Sensor Response Times. Available: http://www.thermo-electra.com/en/producten/technische-informatie/response-times. Last accessed 21/12/2016. electrical4u. (2012). Resistance Temperature Detector or RTD | Construction and Working Principle. Available: http://www.electrical4u.com/resistance-temperature-detector-or-rtd-construction-and-working-principle/. Last accessed 22/12/2016. "Instrumentation & Control: Resistance Temperature Detectors." UKEssays.com. 11 2018. All Answers Ltd. 04 2019 <https://www.ukessays.com/essays/engineering/instrumentation-control-resistance-temperature-2766.php?vref=1>. "Instrumentation & Control: Resistance Temperature Detectors." All Answers Ltd. ukessays.com, November 2018. Web. 20 April 2019. <https://www.ukessays.com/essays/engineering/instrumentation-control-resistance-temperature-2766.php?vref=1>. UKEssays. November 2018. Instrumentation & Control: Resistance Temperature Detectors. [online]. Available from: https://www.ukessays.com/essays/engineering/instrumentation-control-resistance-temperature-2766.php?vref=1 [Accessed 20 April 2019]. UKEssays. Instrumentation & Control: Resistance Temperature Detectors [Internet]. November 2018. [Accessed 20 April 2019]; Available from: https://www.ukessays.com/essays/engineering/instrumentation-control-resistance-temperature-2766.php?vref=1.